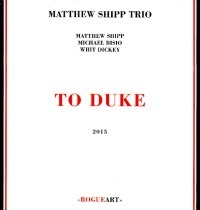 Shipp introduces the album with “Prelude to Duke,” 44 seconds of unaccompanied piano in which he may be ruminating on Ellington’s 1953 solo recording “Reflections in D.” Then Shipp, bassist Michael Bisio and drummer Whit Dickey transport the listener to Ellingtonia proper with “In a Sentimental Mood.” Shipp concentrates on melodies—Ellington’s and those the pianist creates—while Bisio plays free counterpoint, Dickey layers cymbal splashes on brushed snare drum patterns and Shipp minds the outline of the song. Abetted by the ESP of Bisio’s and Dickey’s reactions, Shipp’s time displacement rules “Satin Doll.” The trio takes “the ’A’ Train” on a wild ride breathtakingly close to, but not over, the edge of coherence. So it goes through seven Ellington pieces and four compatible Shipp originals. Riveting stuff by three extraordinary musicians finely attuned to Ellington but, most of all, to one another.